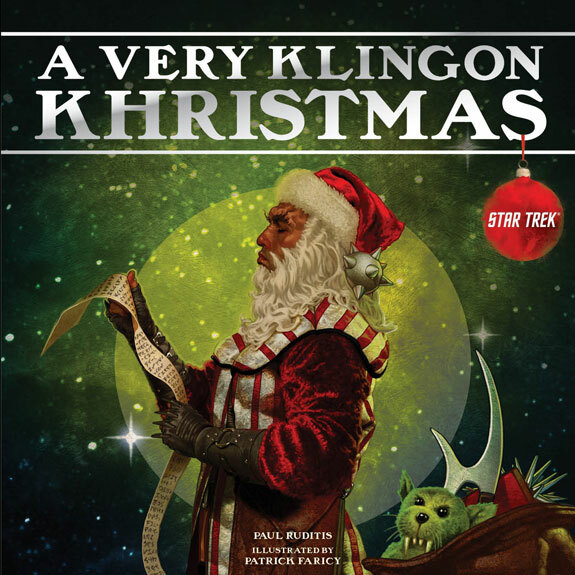 StarTrek.com have revealed the cover art for the forthcoming A Very Klingon Khristmas. A festive look at the Klingon culture, coming from Gallery Books in October, just in time for Human Christmas. The book will be written with rhythm and rhyme by Paul Ruditis, with illustrations by Patrick Faricy. A hilarious, illustrated holiday gift book that celebrates the rich Klingon Christmas traditions—perfect for Star Trek fans everywhere. A Very Klingon Khristmas recounts, in rhyming verse, the treasured children’s story of the birth of revered warrior Kahless and celebrates the rich Klingon Christmas traditions originating on Qo'noS and spreading across the Star Trek universe. This hilarious parody from acclaimed book packager becker&mayer! firmly plants Klingons at the center of the Christmas story—where they rightly should be—and includes everything from a Santa equipped with retractable claws, Tribbles in the stockings of naughty Klingon boys and girls, and the warmth of a hot cup of mulled blood wine. Illustrated in a nostalgiac Norman Rockwell–inspired style, A Very Klingon Khristmas is the perfect holiday gift for every Star Trek fan. Better hope you've all been honorable boys and girls, so Sanata Claws can deliver you this Christmas treat. If not, he'll probably just give you a tribble! That's pretty cool looking. Nice and creative cover. I'll have to pick this up, or might add it to the Christmas list this year. The Seekers to become real books!